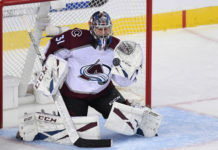 The Colorado Avalanche took control of the game early in Buffalo and never looked back, blowing out the home team, 6-1. It was a nice bounce back for a team that needed it, coming off a poor performance in Columbus and not wanting to leave this mini road trip empty handed. 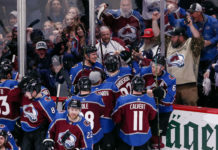 What did we learn from this Avs victory? Mikko Rantanen is going to be a free agent this summer, and if his start to the year is any indication, he will be cashing in big time. With three more assists tonight, he leads the team in points with seven, and has registered the primary assist on all five of Nathan MacKinnon’s goals. While MacKinnon gets all the hype, Rantanen is probably just behind him in terms of importance up front. Semyon Varlamov has taken a stranglehold early on the starting position, and doesn’t look like he wants to give up the net. He was very strong all night long, and had to be great on the penalty kill because the Avs were in the box a lot. Expect him to start when the Avs are at home Saturday night against Calgary. Every single member of the second line picked up a goal in the game. Granted, they all did it different ways, with none of them actually assisting on the other’s goals, but you have to be happy with the production the team is getting from Wilson, Jost, and Kerfoot. Jost in particular deserved to be rewarded after three strong games and nothing to show for it on the scoreboard. Sam Girard is a gift from the hockey gods, and the Avs are benefitting greatly from it. He has taken his game to a whole new level and looks ready to take flight into the elite status of NHL defensemen. One thing he would not do last year was shoot the puck, and this year he’s doing it a lot more frequently, and the production is following. Vladislav Kamenev found his way back into the lineup after a brief stint in the AHL. He made a real good play on one of his first shifts, feeding Matt Calvert for a nice chance in the slot, but due to all the penalties, didn’t see a ton of ice time the rest of the game. He’s a real wild card for the team and would add some nice skill to the bottom six. The Avs now head home for one game, as they take on the Calgary Flames on Saturday evening. The game starts at 8 PM MST.